Before you finish reading this article a kitten or puppy will come into this world and will sadly go on to represent just one of the hundreds-of-thousands of unwanted companion animals in Australia. Each year The Lost Dogs’ Home cares for over 30,000 lost and abandoned cats and dogs. Sadly a large percentage of these companion animals are not desexed. The issue of unwanted, straying pets may seem overwhelming, however, desexing just one companion animal has a real and positive effect. It not only protects the wellbeing of an individual dog or cat, but also ensures they will never contribute to the high number of unwanted companion animals. There are additional health and behavioural benefits to desexing, including a reduced risk of cancers and other diseases of your pet’s reproductive organs. Pets that are desexed are also less prone to show behaviours related to reproduction such as roaming, aggression and mounting. Finally, you will help make a difference to animal welfare on a bigger scale by raising awareness and demonstrating that desexed pets are great pets. From July 1, The Lost Dogs’ Home Frank Samways Veterinary Clinic is participating in National Desexing Month by offering discounted desexing to help you, help us make a difference. Fact: Desexing a companion animal helps protect their health and welfare. Desexed cats and dogs are at less risk of getting cancer – mammary cancer in females, testicular cancer in males. Also, male dogs are less likely to have prostate problems, while females are less likely to uterine infections. Desexing both female cats and dogs decreases their desire to roam, which means they are less likely to get lost or hit by a car. Behaviourally, cats and dogs who are desexed are less likely to be aggressive, and in most cases typically calmer and more affectionate. Overall, a desexed animal will generally live a longer and healthier life. Unfortunately, too many kittens and puppies born will not end up finding life-long homes. Many – in particular cats – will end up being dumped on the street, taken into shelters and pounds, or will go on to live a short life as a stray, continuing the cycle of over-breeding. Irresponsible breeding of cats and dogs contribute to the overpopulation problem. Also there is no evidence to suggest that having ‘just one litter’ in anyway benefits a cat or dog. 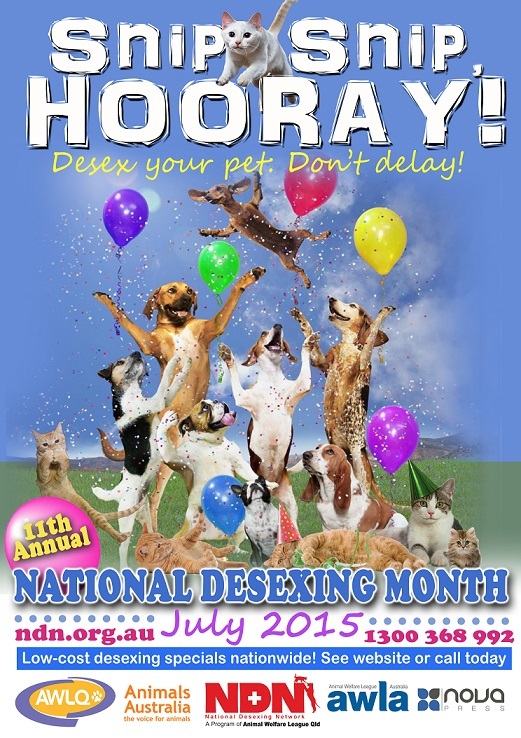 By desexing your pet, you can help decrease the number of unwanted animals. From 1 to 31 July, The Lost Dogs’ Home Frank Samways Veterinary clinic will be offering discounted desexing, on presentation of a pension card, health care card or concession card at the time of booking. Booking are essential and can be made by calling the Frank Samways Veterinary Clinic on (03) 9329 2755 or by visiting the clinic in person at 1 Boundary Road, North Melbourne. Limited surgeries are available; please mention the NDN offer when booking your pet’s appointment.